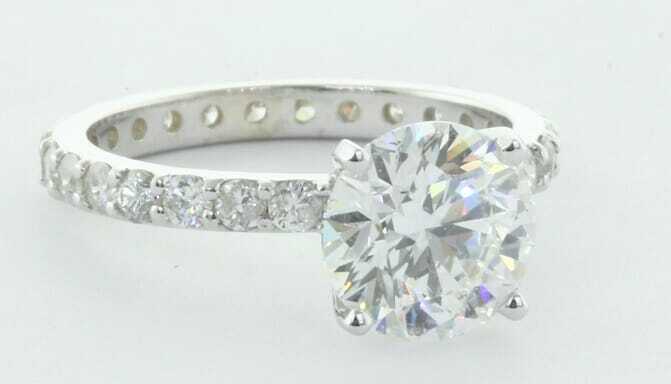 The engagement ring setting can be either plain (solitaire) or have side diamonds. If you are after some extra sparkle adding side diamonds will be a great idea. The ring is in the picture is set with 2.01 carat round brilliant diamond, the side diamonds are approx. 3 point each (0.03 carat) and totaling 1 carat. The ring total carat weight is 3.01 carat. This ring was made in 18K white gold and the diamonds are going all the away around. If you would like the side diamonds just to add sparkle to the ring then you should keep the size of the side diamonds to a minimum. Having said that, the size of the diamonds need to be in proportion to the center diamond and the width of the ring. The wider the ring is the larger the side diamonds need to be, otherwise they will be "cover" by too much metal. If you decided to set the centre diamond on setting that have side diamond you need to make sure all diamonds match. Usually most setting with side diamonds will be of diamonds between 1 point to 20 point. If the side diamonds are under 5 points you can go with lower colour/clarity as you wont be able to see much difference. Having said that, if the side diamonds are over 5 points you want the colour/clarity of the side diamonds to be very similar to the centre diamond. Half way or all the way? We usually suggest to go with diamonds that go either half or three quarter of the way. Having said that, we have done many rings with diamonds that go all the way and received great feedback. Another thing to consider when choosing with engagement ring with side diamonds is the matching wedding ring. In most cases customers would like both rings to look the same and to match as much as possible. Therefore, setting the engagement ring with specific side diamonds(size, colour and clarity) will mean that the wedding ring will need to be set with the same type diamonds.